Are you one of those luckiest people who often get a lot of unwanted text messages? Have you ever experienced being annoyed by those unknown callers and text spammers? If your answer is yes, what you need is a reliable call, text and MMS blocker. Let’s find out if the smsBlocker app has all the features that you are looking for. Created and developed by Optinno Mobitech P. Ltd., the smsBlocker app is a free call, SMS and MMS blocker for Android. 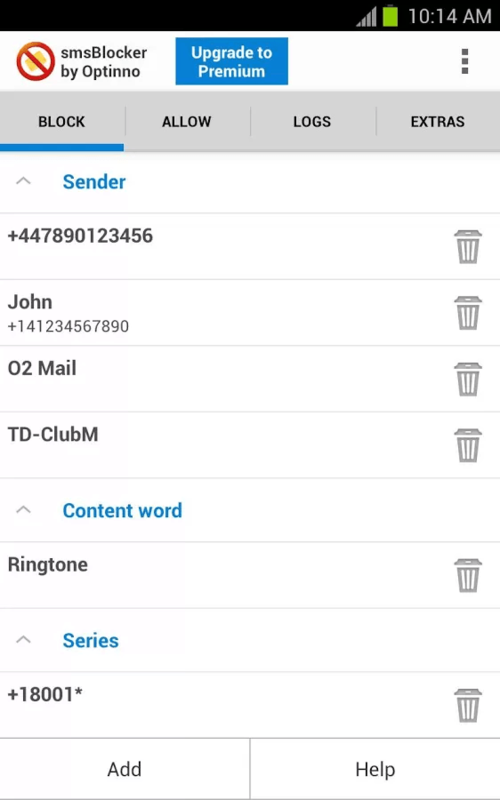 Just like what its name suggests, this app is intended to block all of your unwanted calls, text and multimedia messages. It is a very intuitive app and it will automatically carry out its tasks according to you saved preferences. This app is very useful especially if you keep on getting those annoying text message ads from anonymous text senders. 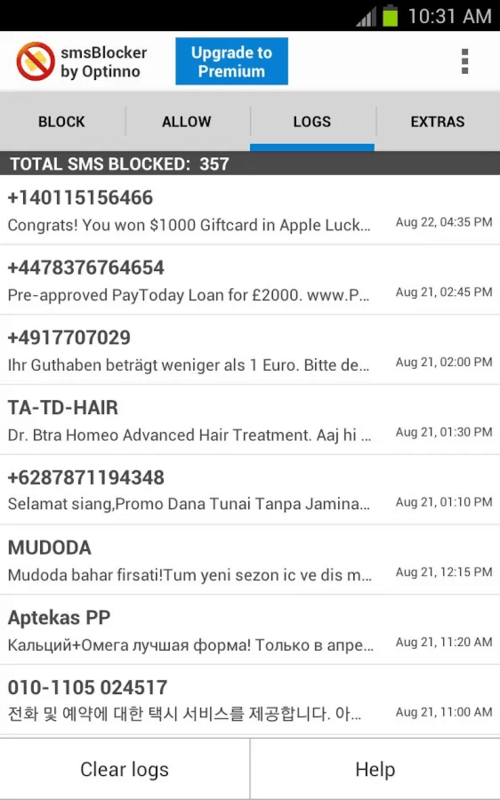 There are a lot of free SMS and call blockers for Android but the smsBlocker has definitely proven its worth. Even if it is only a free version, it does what it is supposed to do and it is very intuitive. It also features a well-designed and responsive user interface so it looks very pleasant and you could easily tell which is which. Its controls aren’t confusing. The menus are properly labelled. What I like about this app is that it’s very easy to use and it’s very straightforward. It actually features four main menus – Block, Allow, Logs and Extras. 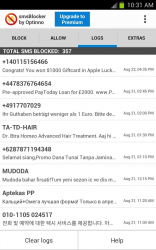 The “Block” menu is meant for the SMS messages as well as the phone numbers or contacts that you want to block. 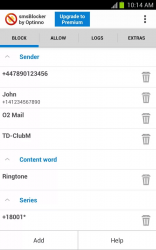 This menu will also give you the option to block a text message by sender, by content or by series. If you block a text message or SMS by sender that means that every SMS that you receive from that particular sender will be blocked. If you block an SMS by content, the app will block any text message that has that particular word so that it won’t appear on your Inbox. Meanwhile, the block text message by Series will allow you to block any number that starts or ends with a particular code or digit. For example, you could block any number that starts with *1005, etc. The “Allow” menu, on the other hand, has the same options with the “Block” menu but instead of blocking a text message or contact, it will permanently allow those numbers and texts to appear on your Inbox. As for the “Logs” menu, it’s where you can view all of your blocked text messages. This gives you the opportunity to review those texts and it’s totally up to you if you want to move them back to your Inbox. What’s also great about this app is that you can easily backup and restore your data. So if ever something unexpected happens, you can easily recover your previous settings. Plus, you can easily find this option at the “Extras” menu. This is also the menu wherein you can set the app’s MMS blocker and Call blocker settings. Another good thing about this app is that it lets you try its Premium features for 7 days. This includes the app’s password protect feature as well as its automated responses. You can also block the number of your overly attached “Ex”. It’s just a bummer that the password protect feature is only available for premium users. This means that with the free version, you cannot easily prevent other people from viewing your list of blocked contacts. It is also a bit disappointing to know that you cannot block a contact or text message without launching the app. It would be more convenient if you can block a number directly from the menu that’s located on the actual message threads. I have to say that smsBlocker is one of the best calls and message blockers that I’ve tried so far. It has a neat user interface, it is very responsive, it’s easy to use plus it does a very good job in keeping your calls and messages inbox free from spam. Aside from spam, you can also rely on this app especially if you want to block calls from unwanted callers. I recommend checking out this app if you want to block unwanted calls and messages. Also, you better check out these best free call and text message (SMS) blockers  for Android.